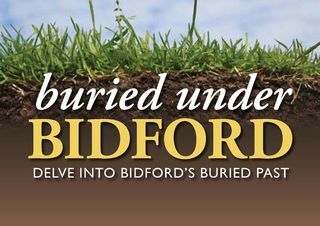 Buried under Bidford was an archaeological outreach project created by Warwickshire County Council and supported by the English Heritage Aggregates Levy Sustainability Fund. The project aimed to deliver a public consultation exercise which addressed the issues of mineral planning and people's concerns and queries of the process involved. The counsultation was designed and created via an Historic Environment Record (HER) outreach programme, which engaged communities affected by past and future aggregate extraction. Project outputs comprised of a travelling exhibition, an archaeological report and a comic aimed at 7-11 year olds.